The AutoAuditorium System is a fully automatic, multi-camera system for televising auditorium and classroom presentations. Once installed in an auditorium or large meeting room, recording or telecasting any presentation given in that room can be as simple as turning on a switch and hitting RECORD. There are no other operator controls. And the presenter does not have to pay any attention to what the AutoAuditorium System is doing. All the shot selections, video transitions, camera motion, focusing and zooming, are performed automatically. The result is often indistinguishable from a program produced by a crew. Send them anywhere in the world! Send videos instead of people! A Tracking Camera That Really Works! See an example of a Projector Talk with Chalkboards on the side. See the Video Just Using Chalkboards? Did they record or broadcast that talk yesterday? No? Too bad you missed it. It was really great! People miss talks, presentations and seminars because the cost and complexity of recording or transmitting the event are just too high. In the past, producing a video of a presentation was a big production. You either had to use a TV studio, or roll in a TV crew and their portable equipment. 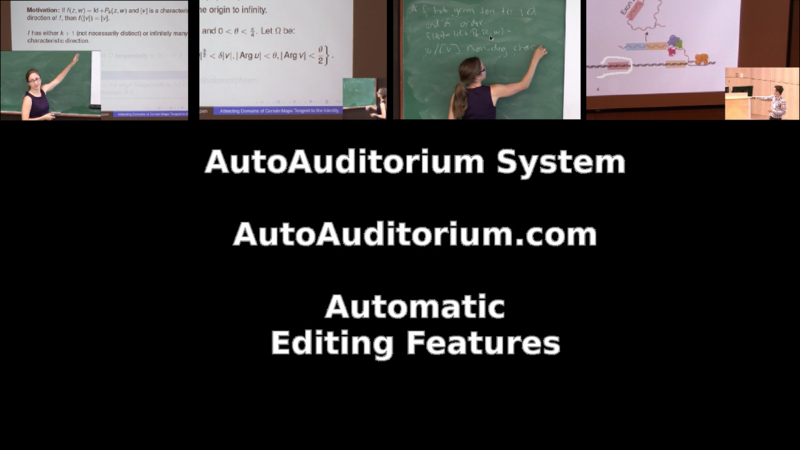 Foveal Systems presents The AutoAuditorium System that turns an ordinary auditorium into one that automatically creates videos of lecture-style presentations for people who could not attend. 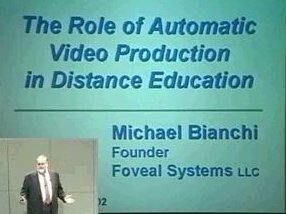 The system's intelligence knows when to zoom in on the presenter, when to focus on the projection screen and when to show both. Connect to your teleconferencing network and/or start up your video recorder. Turn on the AutoAuditorium System. You are producing a 3- or 4-camera video without a crew! See how an AutoAuditorium System can work for you.